Restrictions have been placed in large parts of Srinagar to prevent the proposed protest march by separatist groups. 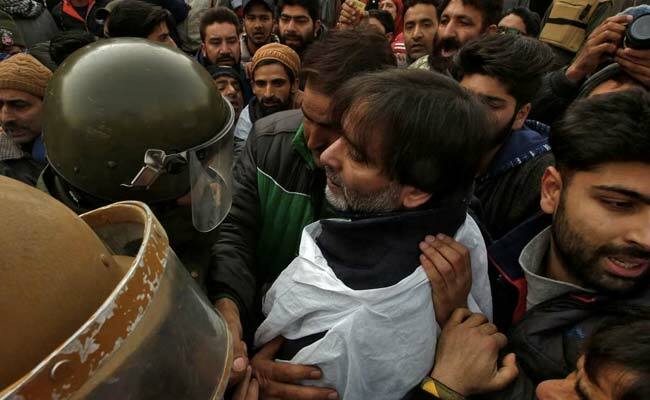 Separatist leaders Mirwaiz Umar Farooq and Yasin Malik were arrested after they tried to take out a march in Srinagar against the killing of seven civilians during an encounter in south Kashmir's Pulwama on Saturday. The two leaders were arrested after they tried to march to the army's Chinar Corps headquarters in Srinagar's Badami Bagh area. The separatists, under the banner of the Joint Resistance Leadership, comprising Hurriyat Conference chief Mirwaiz Umar Farooq, Syed Ali Shah Geelani and Mohammad Yasin Malik, had called for the march against the killings. Mirwaiz Umar Farooq defied house arrest as he tried to march towards the army headquarters. Seven civilians were killed and dozens injured in Pulwama district on Saturday after security forces opened fire during clashes that followed an encounter in which three terrorists were gunned down. A soldier was also killed in the encounter. Seven civilians died and several others were injured allegedly when security forces opened fire at a mob that thronged the site of an encounter in south Kashmir's Pulwama district in which three terrorists and a soldier were killed on Saturday. A defence spokesman condemned the protest call by the separatists.